For those of you who already follow a vegetarian diet, you most likely are familiar with the ingredient farro. For those of you wondering what it is, it’s a delicious and hearty grain with a nutty flavor similar to brown rice. It is rich in fiber, magnesium and vitamins A, B, C, and E too. It actually looks like brown rice and it is readily available in most grocery stores, usually in the rice aisle. We encourage you to give it a try as a nice alternative to your favorite starch or grain. 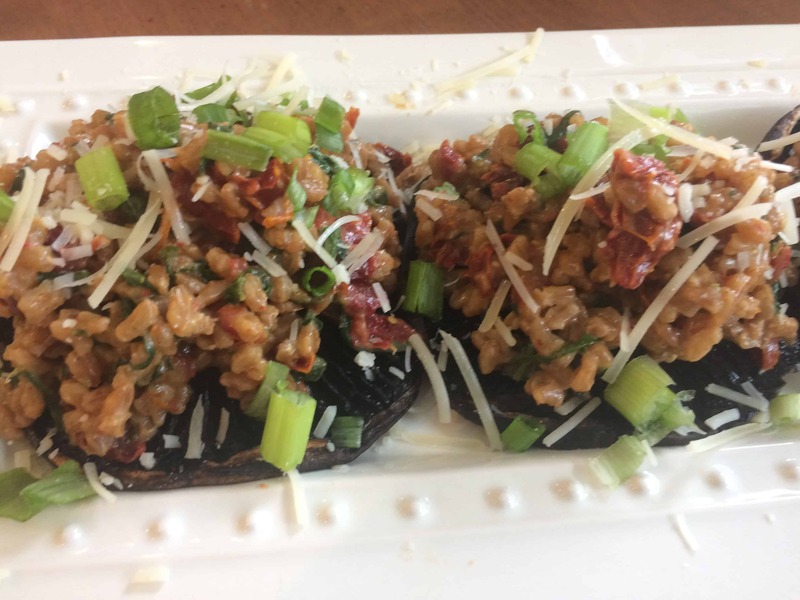 This Farro Stuffed Portobello Mushrooms recipe is a delicious way to prepare farro whether you are familiar with it or not! However, whether you think it is a funky ingredient or not, this recipe was as delicious as it was quick. We cooked the farro in broth to give it a bit more flavor, as well as adding some sun-dried tomatoes and baby spinach for color and some extra nutritional punch. But the star ingredient was swirling mascarpone cheese into the mix at the end of cooking, giving it amazing flavor. We used portobellos as the main course but you could easily make up this mix for a side dish with seafood or your favorite main course. Preheat broiler. Cook farro in broth according to package directions, adding spinach, sun-dried tomatoes and thyme during last 10 mins of cooking time. Remove from heat and stir in mascarpone cheese until melted. Season with salt & pepper. Meanwhile, while farro is cooking, spray broiler pan with cooking spray. Remove stems from portobellos and place portobellos on broiler pan. Broil for about 8 to 10 mins or until softened. To serve, place portobellos, stem side up on platter. Spoon farro mixture on mushrooms and top with parmesan and scallions. 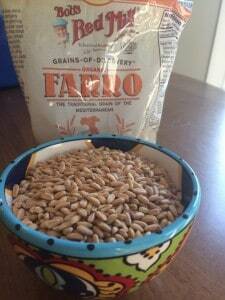 Serve extra farro on side.